Perihelion 2015: The Earth is closest to the Sun tonight. 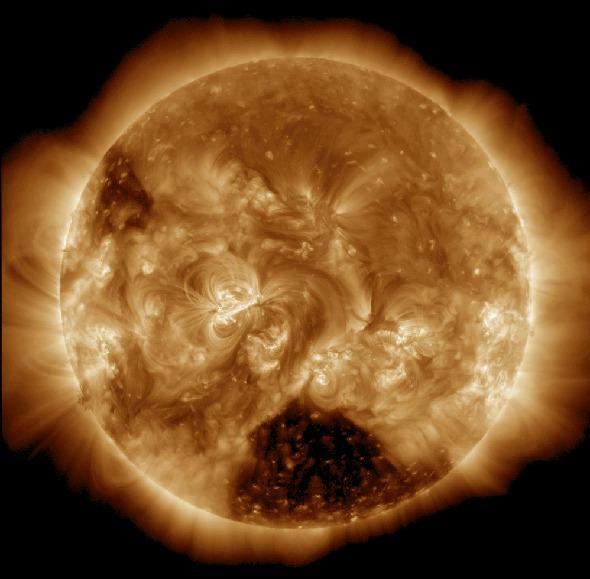 The Sun as it appeared just a few hours before perihelion 2015, as seen by NASA’s Solar Dynamics Observatory. This image is in the far ultraviolet, emphasizing the corona, the star’s outer atmsphere. Note the “coronal hole” near the bottom, where the solar wind streams away from the Sun. Just a quick note to let you know that tonight marks the point where the Earth is closest to the Sun all year: perihelion. The moment this happens is at 06:36 UTC Jan. 4, 2015. That translates to 01:36 Eastern U.S. time, or 10:36 p.m. Pacific time on Jan. 3. So technically, this happens tomorrow for people on the East Coast, but today for those of us in Mountain and Pacific time. Living on a round ball can be weird. At that time, the center of the Earth will be 147,096,204 kilometers (91,401,343 miles) from the center of the Sun. On average, that distance is 149,597,871 km, so we’re roughly 2.5 million km closer tonight than on average. Mind you, the Earth’s distance from the Sun is always changing because we orbit our star on an ellipse, not a circle. Yesterday we were a wee bit further away than today, and tomorrow we’ll be a wee bit further away again. One day after perihelion, for example—on Jan. 5 at the same time—the Earth’s center will be 147,096,683 km from the center of the Sun, a difference of less than 500 kilometers from today’s distance. You’d never have noticed. The date of perihelion changes every year due to many factors, the biggest, oddly, being the Moon. The Earth and Moon orbit around a common center of gravity, like two kids facing each other, holding hands, and swinging each other around in a circle. It’s that center of mass (called the barycenter) that orbits the Sun. When the barycenter reaches perihelion, the Earth might actually be a bit farther away than usual because the Moon has swung it out. This changes the moment of perihelion for the Earth, sometimes by a day or more. I’ve written about all this many times for perihelia past: Here are my articles for 2014, 2013, 2012, 2011, and 2010 just to get you started.